Recently I moved my projects to 32 bits ARM way. After some time thinking about various platforms, I’ve decide to abandon any Windows based tool, and trying to work only with Mac, without Parallels Desktop. For small 8 or 16 bits PIC projects, I still use MPLABX. 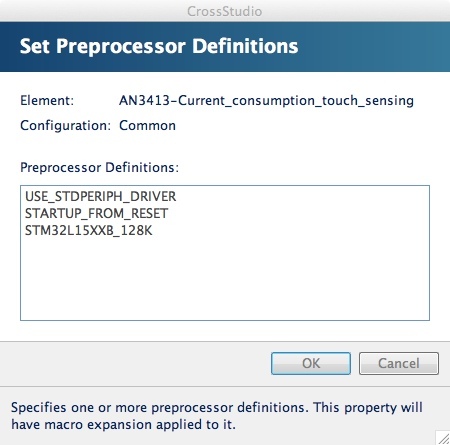 For ARM core I’ve decide to use STM32 series. As development tool I’ve chosen Rowley CrossWorks. They have a reasonably price for non-commercial use ($150) and the most important, a Mac Os Lion version. I’ve also bought some STM32 boards, and in that post I’ll show my steps with one of them: STM32L-DISCOVERY. The other boards I also have are STM32F4-DISCOVERY and WaveShare Port103R (great board! post more later). The STM32L-DISCOVERY helps you to discover the STM32L ultra low power features and to develop and share your applications. It is based on an STM32L152RBT6 and includes an ST-Link/V2 embedded debugging tool interface, a LCD (24 segments, 4 commons), LEDs, push buttons, a linear touch sensor or touch keys. Recent version of Rowley CrossWorks for ARM added support for ST-Link/V2 programmers, so you can connect STM32L-DISCOVERY board directly to your Mac and start ARM developing. Unfortunately, ST doesn’t have a Mac friendly package. You will see that it’s a Windows “.exe” that install it under Program Files/STMicroelectronics directory. But you’re lucky. I’ve already unpack it and share over my dropbox account. Click here and unpack it on your CrossWorks projects directory. Select menu “File“, then “New Project” menu item. Select the “STMicroelectronics” from the Categories list. 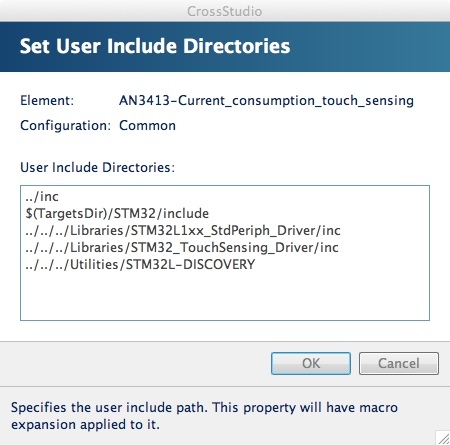 Select the executable for STMicroelectronics STM32 from the Templates list. 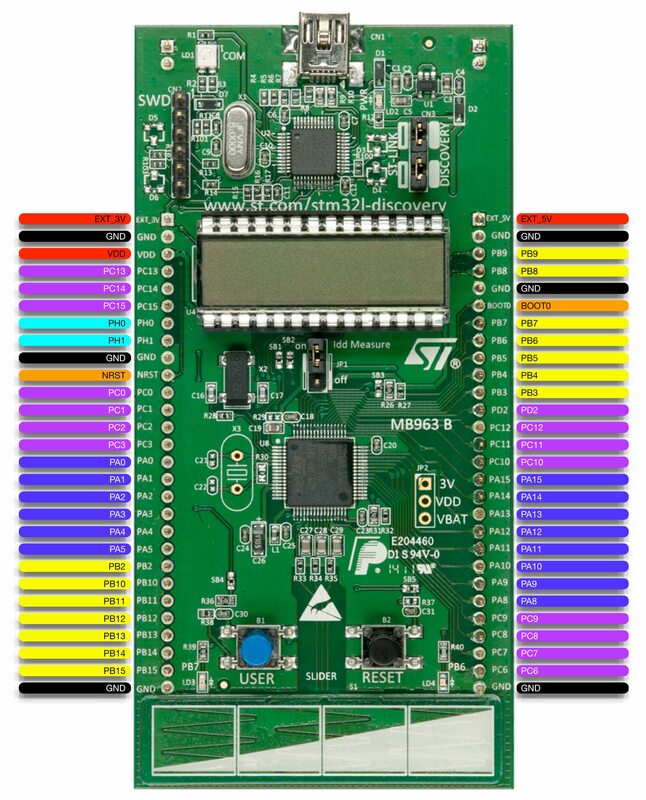 Select the Target Processor as STM32L152RB. You can finish it from here. Select menu “Project“, then “Properties…” menu item. The Project Manager window appears. Don’t close Project Manager window, yet. There’s nothing about “UNPLACED_SECTIONS” under CrossWorks for ARM Reference manual, so I’ve been opened a trouble ticket for CrossWorks support team. They are very smart and always catch what you need (if you provide them all the details). According to support, the variable is being placed in a “.DataFlash” section which needs to be allocated into the EEPROM segment. “UNPLACED_SECTIONS” exists to catch errors when sections haven’t been placed. (Thank’s Michael Johnson from Rowley!). Tap two fingers in Project ‘AN3413-Current_consumption_touch_sensing’ and select “Import Section Placement” to get a project local copy of the section placement file “flash_placement.xml“. Tap two fingers on file “flash_placement.xml” and select “Open With” then “Code Editor“. So, your problem is here: “__INLINE” isn’t supported by CrossWorks. Remove only the “__INLINE” and repeat it for “__TSL_wait_CLWLTA” function. Now, Clean and Rebuild the entire solution. That’s it! Compile Ok! Connect the STM32L-DISCOVERY board to your Mac. Target, Download it to board and see… it’s works! If you want my entire project files, you download it on my downloads page. Unpack it under your CrossWorks project directory. These files contains all my entire folder. Next post I’ll show how to compiling the other example, AN3964-Temperature_sensor.